Accuracy was also an important factor and squires practised "Running at the Rings" where the lance was aimed at a target in the shape of a ring - these rings were obviously much smaller to lance than a man and this skill was therefore difficult to master. Skill in using Medieval weapons was dependent on weapon practise. The Quintain was used for training in the use of the Medieval Lance. A quintain enabled target practise with a lance. This idea was 'borrowed' from the Romans. The First Stage of training - A Page would start to acquire the skills required of a Knight by practising the skills of tilting a lance against the quintain. At first a target was erected and the Page would mount a wooden 'horse' on wheels holding a lance. The wooden horse would be pulled along by two other pages towards the target and the page would aim the lance. The second stage of training - As the apprentice Knights, the squires, acquired the skills of horsemanship they would practise against a shield and dummy which were suspended from a swinging pole. The shield was hit by a charging squire and his objective was to avoid the rotating arms and not get knocked from the saddle. The dummy was often made to look realistic by portraying symbols of the knights current enemy. 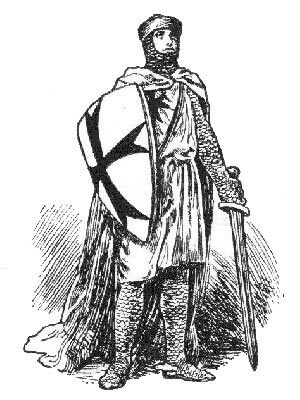 A dummy would be designed to look like a Saracen, for example, during the period of the crusades. Weapons practise - Fully fledged knights would also practise at the quintain to ensure their skills using the lance were in peak condition and that their bodies remained fit and agile in preparation for his role as a fighter. Each section of Middle Ages Weapons provides interesting facts and information about Medieval warfare in addition to the Quintain. The Sitemap provides full details of all of the information and facts provided about the fascinating subject of the Medieval period of the Middle Ages!